This article is about an actress. For tropical cyclones, see Tropical Storm Sarika. Sarika Thakur, better known as Sarika, (born December 5, 1960) is an Indian actress. Apart from acting, she also served as costume designer, sound designer & associate director for Kuruthipunal under Raaj Kamal Films International. In 2005, she won the National Film Award for Best Actress for the English film Parzania. 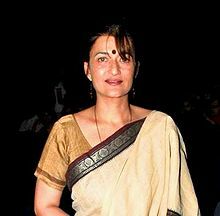 Sarika was born in New Delhi into a family of Marathi and Himachali descent. Her father left the family when she was very young. From then on, she became the head of the family and had to work. She did not attend school. Sarika started her film career as a child actor at the age of 5, playing the role of a boy, Master Sooraj, during the 1960s in Bollywood. Her most notable and popular appearance as a child artist was in the year 1967 in the musical superhit Hamraaz, where she was seen as the daughter of Vimi named baby/saarika. She appeared in many children's movies. Later, she moved on to films with Rajshri Productions Geet Gaata Chal with Sachin, with whom she starred in many Hindi and Marathi films. In Sarika's acting career, she was often cast as a "westernized girl" in films due to her Non-Indian looks. She gave birth to a baby girl, Shruti Hassan in 1986. She gave up her acting career after her marriage to Kamal Haasan and moved to Chennai with him during the peak of her career. After separating from her husband, she made a comeback in Hindi films. She played Ipsita Ray Chakraverti in the film Sacred Evil – A True Story which failed at the box office. In year 2000, Sarika won the National Film Award for Best Costume Design for the film Hey Ram. Her performance in Parzania in which she plays the role of a Zoroastrian woman who loses her child during the 2002 riots of India, earned her the National Film Award for Best Actress. Sarika has starred as Sheetal Thadani in the movie Bheja Fry (2006), where she played the wife of Rajat Kapoor. She also had a small but important role in Manorama Six Feet Under. Her latest movie is Shoebite, which has been delayed for production, where she stars opposite Amitabh Bachchan. Sarika made her television debut in Sony TV's Yudh which stars Amitabh Bachchan in the lead role. Balak 1969 (as Baby Sarika) Deepak "Deepu"
Pratibha Devisingh Patil presenting the Best Film Actress Award for the year 2005 to Ms. Sarika for her role in English Language Film "Parzania", at the 53rd National Film Awards function, in New Delhi on September 14, 2007. ^ "I get devastated at the idea of marriage: Shruti Haasan". Retrieved 18 January 2014. ^ "Times of India". Times of India. p. 6. Retrieved 31 March 2014. Wikimedia Commons has media related to Sarika.